Full breakfast consists of a selection of fruit juices, whole grain bakery toast, tea or perculated coffee to accompany your fresh local farm eggs, bacon, ham or sausage, with garden fresh tomato slices and a fruit cup. A selection of fresh home-made jams tops off your morning meal. We offer a wide variety of heart healthy whole and multiigrain cereals as well, on any day of the week. 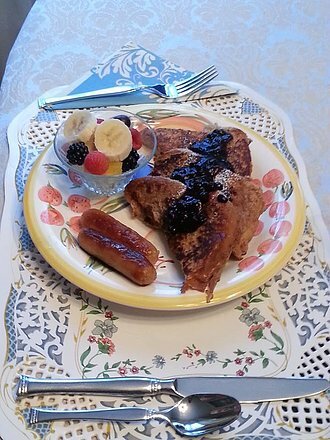 Wanda's homemade 'French Toast' with Blueberry sauce, fresh cut fruit bowl and sausages. 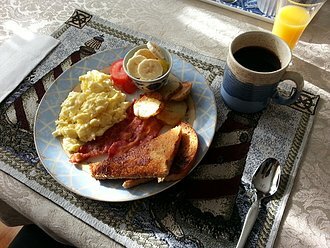 One of our breakfast delights at the Harbour Tide Inn B&B. 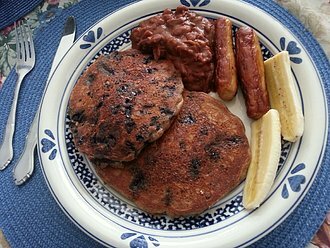 Wanda's specialty is unique and delicious pancakes; served with hot Bluberry sauce, Maple Syrup and Banana Wedges, juice, tea and coffee. Our blueberries come right from the fields in our area; fresh, wild, all natural and soooooo.... good. Yum! No syrup yet applied to this sample. Four deliciously different recipes, for you to enjoy with our compliments. You may copy these to your own files with our blessings. Place raisins, dates and soda in large mixing bowl, add boiling water. Cool slightly. 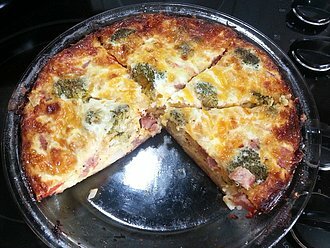 1 1/2 cups milk, 1 cup canola oil, 1 cup honey, 2 eggs, 2 tablespoons grated lemon peel, 2 teaspoons vanilla, Mix wet to dry mixture. Fold in berries. Bake 375 degrees for about 20 minutes. 2 cups rolled oats, 1 1/2 cups milk, 1 1/2 cups honey, 1 cup canola oil, 1 cup orange juice, 2 eggs, 2 tablespoons grated orange peel, 2 teaspoons vanilla. 4 1/2 cups whole wheat flour, 4 teaspoons baking soda, 1 heaping tablespoon cinnamon, 2 teaspoons salt, 2 cups fresh or frozen cranberries coarsely chopped, 1 cup chopped pecans. Combine wet and add to dry mixture. Fold in cranberries and nuts. Bake 400 degrees,15 to 20 min. 3 cups milk, 1 1/2 cups mashed bananas, 1 cup honey, 3 eggs. 3 1/2 cups whole wheat flour, 3 1/2 cups rolled oats, coconut, pecans raisins, dates in a blended mix. Use whatever quantities you like as long as you end up with 3 1/2 cups. 2 tablespoons baking powder, 1 1/2 tablespoons baking soda, 1 1/2 tablespoons cinnamon, 1 teaspoon nutmeg, 1 teaspoon salt. Mix wet to dry mixture. That's all for now. We hope you enjoy these healthy favourites, and thank you for visiting bbcanada.com/htinn and www.htinn.ca; The Harbour Tide Inn.